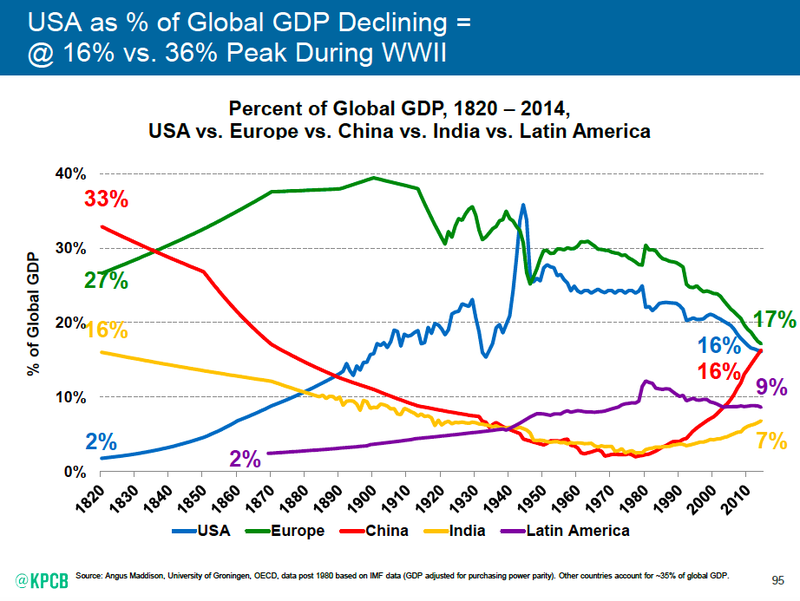 Mary Meeker of Kleiner Perkins Caufield & Byers once again unveiled her annual Internet Trends report at Code Conference. I’m most interested in the implications on e-commerce and marketplace businesses, and here are my takeaways. 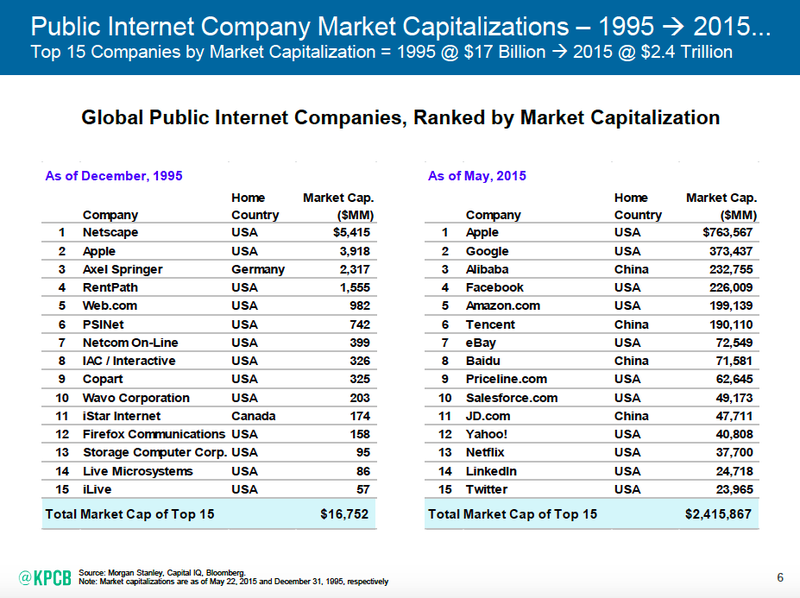 5 of the top 15 global public internet companies by market cap are e-commerce or marketplaces, and still less than 10% of retail sales are e-commerce. China is going to be the biggest economy in the world, and it won’t be long before the majority of Apple’s revenue comes from China. It’s an incredibly difficult market to do business in, and it’s not the lowest hanging fruit for most companies. But soon enough, all of the world’s leading commerce companies will be selling in China. 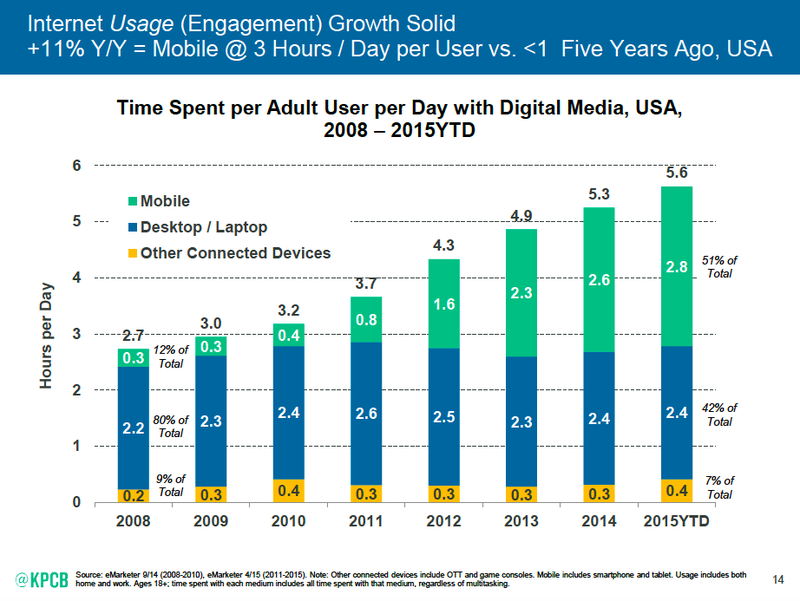 Mobile time spent isn’t replacing desktop time spent. It’s additive. This means more opportunity to engage with and sell to consumers. It’s not only subpar mobile experiences that drive lower e-commerce conversion on mobile, but also that time spent browsing e-commerce for leisure on mobile is outpacing money spent shopping on mobile. 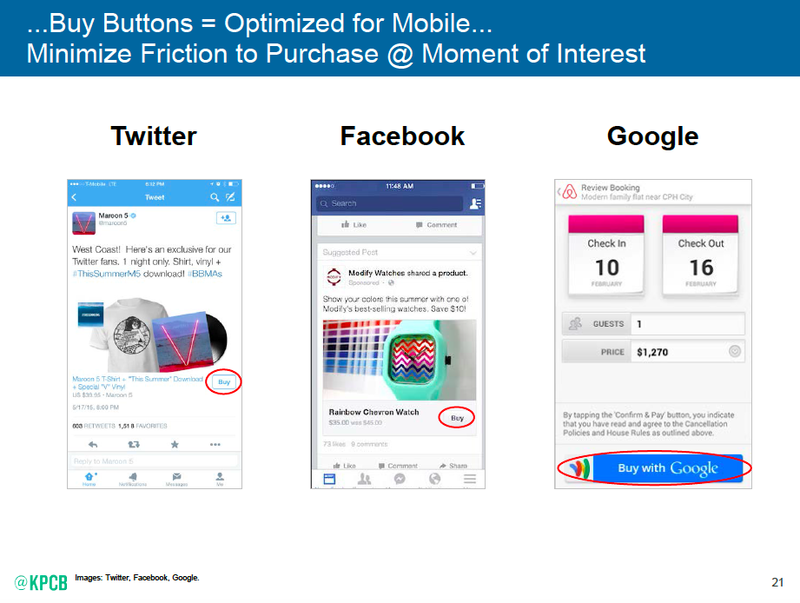 Mobile ad formats and buy buttons: Commerce businesses are seeing early success with multi-product ads (what Meeker calls Facebook Carousel ad), and many of them already depend heavily on Google Shopping. Deeper integration and reduced friction in these channels will help small and mid-size commerce business much more than it will hurt them in the near-term. The revenue will be mostly incremental, especially for commerce businesses without a mobile app. Bigger players with high repeat rates could have more to lose than the small and mid-size ones. But if Google owns the customer and the email address, that could deter usage of the buy button and similar features among commerce businesses of all sizes. There’s a bunch of technology now available that makes delivering amazing customer service possible even for Comcast. Expectations are higher than ever, but so is the willingness to share great experiences in social channels. Messaging platforms also provide a potential for delivering delightful customer service. 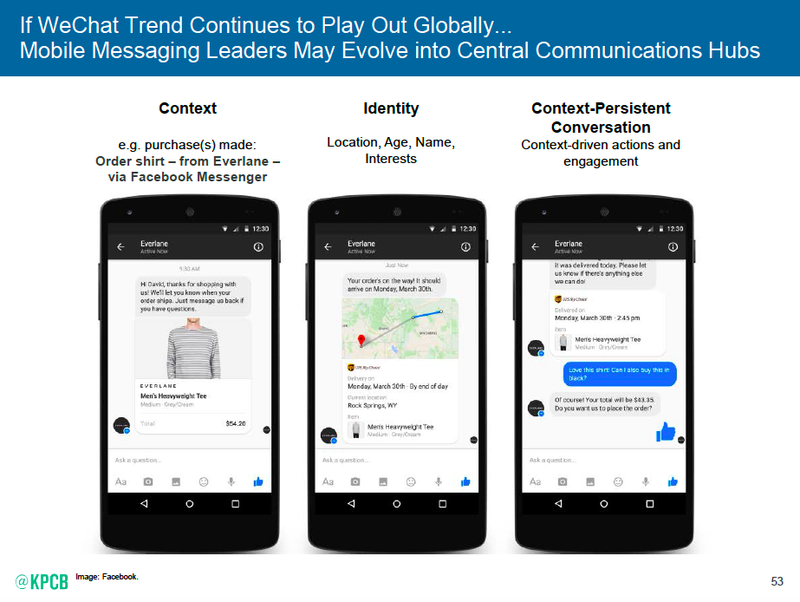 With the exception of Snapchat, I see messaging platforms with more immediate potential as customer service/order status/retention channels than acquisition channels. Everlane and Zulily are already using Facebook Messenger in this way. Facebook, Instagram and Snapchat are the most important social channels for e-commerce. 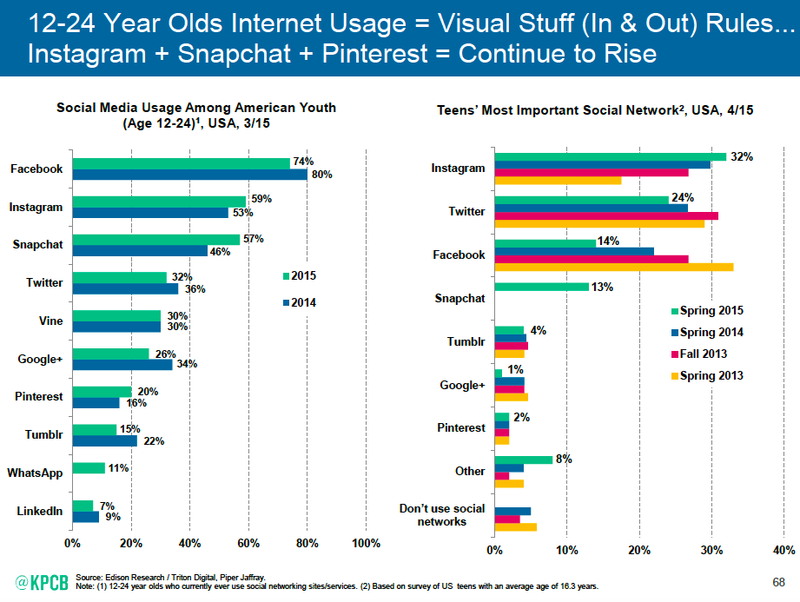 Facebook because it’s the biggest and not going away, Instagram because it’s the best for e-commerce and the primary social platform for younger Millennials and Snapchat because in a couple of years it will be the primary social platform for 18–24 year olds. Ubiquitous two day and premium same-day delivery is a threat to traditional e-commerce. In San Francisco, I can pay $4.99 to get same day delivery from Google Express without a membership or free same-day from Amazon included in my $99 annual Prime membership. Same in New York and in many Asian cities. Traditional e-commerce will be pushed to deliver more and more value if 5–7 day delivery for a fee continues to be the standard. 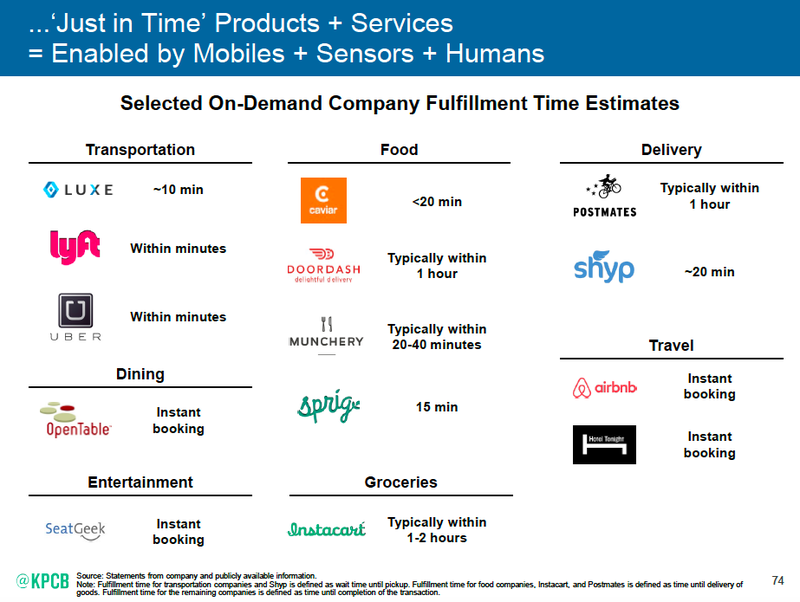 81% of the US population is urban, and on-demand services are coming to all of them. India is the #1 or #2 market for many consumer internet companies because it’s more open than China, but purchasing power there is very low and infrastructure is problematic. You’ll notice that all the India e-commerce data Meeker uses is in percentages rather than absolutes. 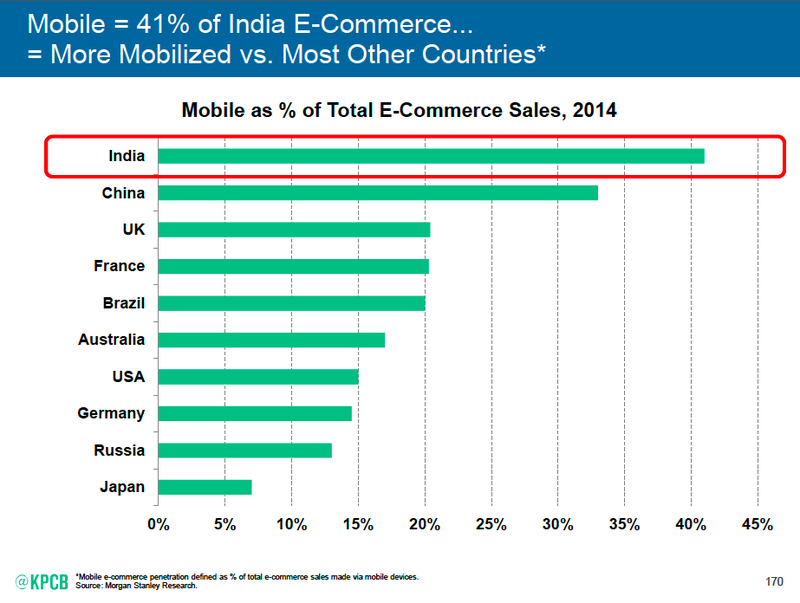 For e-commerce companies, India is much less important than China in the next 5–10 years.